World Fest tables covered in replicas different countries provided by the IU Southeast Center for Cultural Resources. Parents and students listened to and read stories in Spanish, ate food from cultures around the world and participated in activities that allowed them to learn about countries in Europe, Asia, Africa and other parts of the world. The kimonos, sombreros and artifacts, along with other materials, came from culture kits from the Center for Cultural Resources (CCR) at IU Southeast. 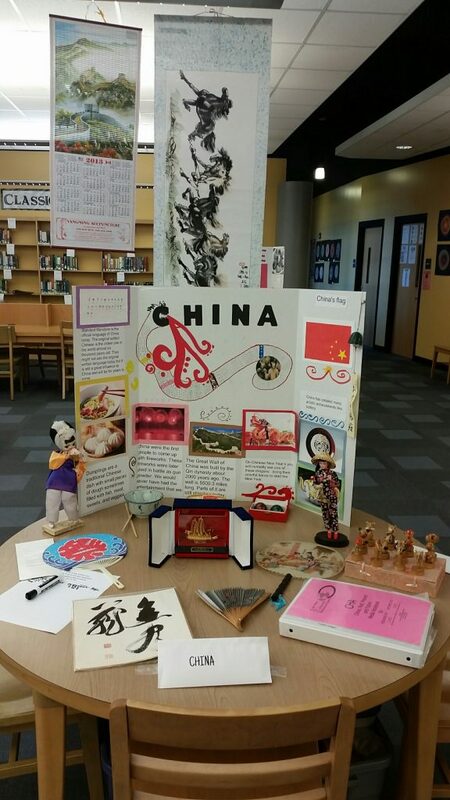 The materials were displayed at Charlestown High School’s World Fest celebration in April. The CCR, located on the third floor of the IUS Library, provides cultural materials to area schools and outreach programs. The center is home to artifacts, garments, maps, coins, informational materials and even food containers from countries around the world. Wall art hangs in the center, kimonos are displayed along with statues and other items, and containers filled with items from various countries and cultures can be found around the center. Three IU Southeast employees involved with the New Neighbors Center (NNC) – which works with teachers and parents to help students learn English and promotes the acceptance of other cultures – took 30 CCR kits, along with some garments, to World Fest. The kits represented Sudan, Haiti, Romania, Italy and other countries around the world. Laura Alverson, administrative assistant in the School of Education and family coordinator for the NNC, worked at World Fest with Magdalena Herdoiza-Estevez, professor of graduate education and director of the NNC, and Carol Goetz, youth program coordinator and presenter for the NNC. A table representing artifacts from China, as provided by the Center for Cultural Resources. Alverson said the NNC staff considered the countries students were from and the students’ cultural heritages when choosing kits from the CCR. She also said World Fest allowed students, teachers and administrators from four Charlestown schools – Charlestown High School, Charlestown Middle School, Jonathan Jennings Elementary School and Pleasant Ridge Elementary School – to learn about and celebrate other cultures with members of the community. Alverson said she enjoyed working at World Fest because the attendees were able to learn about different cultures. During World Fest, Alverson worked in the library, where a read-aloud program occurred for kindergarten through fifth-grade students. The program occurred in two languages, so the students sat and listened to a story a parent read in Spanish before listening to the same story a teacher read in English. Then, each of the students received a free bilingual book from Alverson after she asked them a few questions about the story they listened to. Alverson said Goetz led older students in activity that involved rolling dice, picking a book written in English and Spanish, and turning to the page corresponding with the number they rolled to read the page aloud. Each student then received a book as a prize. “That was a lot of fun for them,” Alverson said. 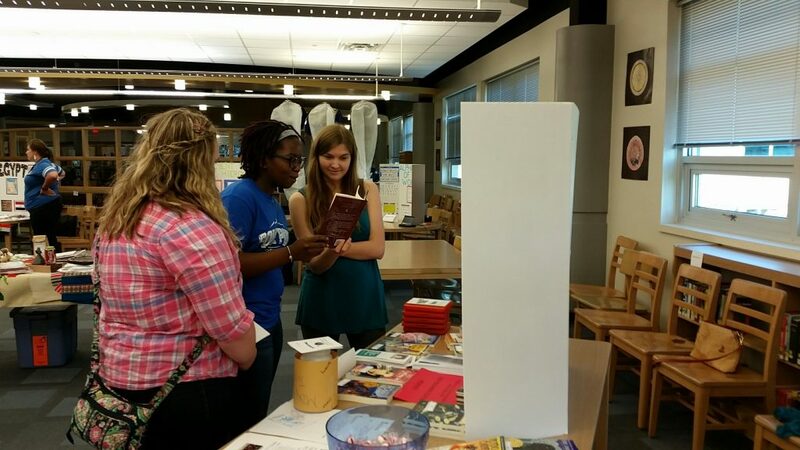 Students examine books from around the world at World Fest at Charlestown High School. Books and artifacts were provided by the Center for Cultural Resources. At World Fest, Alverson, Herdoiza-Estevez and Goetz also discussed the importance of showing compassion toward English Language Learners (ELLs). Alverson said that when students who primarily speak English are put in a situation where they are immersed in another language, the students understand how others who don’t speak English feel, so it helps them see they need to be more compassionate toward ELL students. “If you get one of the students to be more compassionate toward the ELL students, then others will follow,” Alverson said. Several teachers and administrators enjoyed seeing students and parents interact with the artifacts and other items from the CCR, Alverson said. “Administrators were very happy, very impressed by the whole setup, the parents enjoying all the different cultures and the different foods,” Alverson said. Alverson said the NNC has used the CCR for many years to provide cultural materials for World Fest and similar festivals at Indiana schools. In the past, the NNC has been involved in cultural festivals at Northaven Elementary School in Jeffersonville, Parkwood Elementary School in Clarksville and other local schools. The NNC wants to increase teachers’ awareness of the CCR, Alverson said. Alverson said being able to provide a hands-on experience is really important to the NNC and the CCR. She also said the CCR staff and volunteers are working to get feedback from teachers so the center’s kits can be updated, since technology has advanced since the kits were first made. Alverson said the NNC will continue to work with the CCR, and the NNC staff hope the CCR’s reach will grow to more counties, since culture kits from the CCR are primarily used in Clark and Floyd counties. Alverson said the CCR is a resource at teachers’ fingertips, and kits from the CCR can help teachers save time and energy, because they help eliminate the need for teachers to extensively research countries or cultures on their own. Teachers can then devote more time to planning their own activities involving the items in the kits, she said. 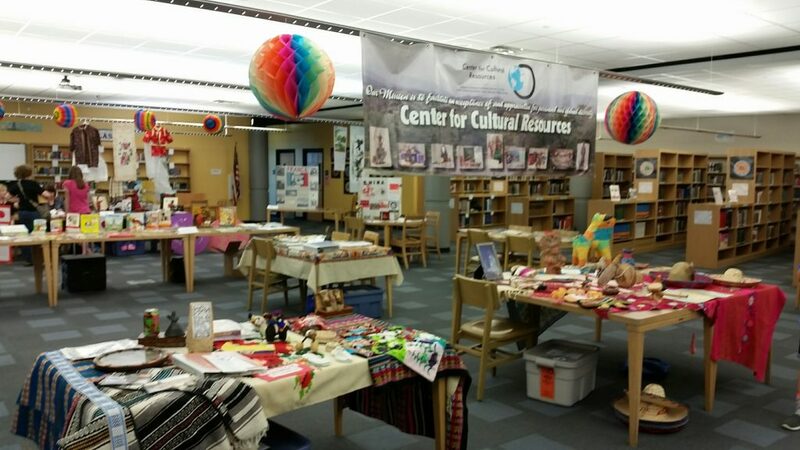 Alverson encourages donations of artifacts, garments and other items from around the world to the CCR, so teachers can use the items to help students learn about other countries and cultures. Alverson said Crump and other CCR staff and volunteers are helpful and easy to work with. Before teachers can check out a kit, they need to attend a brief orientation session to help them learn about the basics of the CCR, where everything is in the CCR, what’s available and how to check kits out, Alverson said. Once teachers have completed the orientation session, they can come to the CCR to check out culture kits for free, or kits can be delivered from the CCR to their schools. Teachers can also request to check out kits by submitting a form on the CCR’s website. For more information about New Neighbors, contact Alverson at lalverso@ius.edu or 812-941-2107, or contact Herdoiza-Estevez at mherdoiz@ius.edu or 812-941-2302. For more information about the CCR, contact the center at ccr@ius.edu or 812-948-8123.